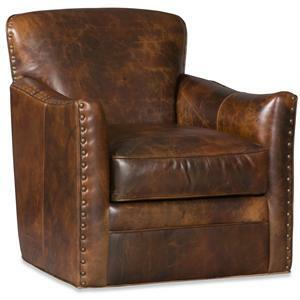 This traditional swivel glider tub chair will give your traditional style home a touch of casual comfort. The tight plush back cushion wraps around to form curved rolled arms. The arms fronts are adorned with classic nail head trim. 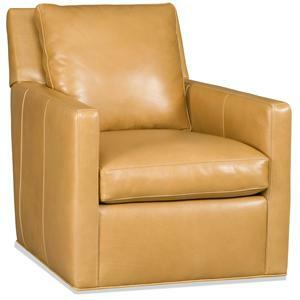 This glider tub chair is available in over 300 fabrics and 250 high quality leather by special order, with multiple nail head trim options. This chair is also available with swivel motion. 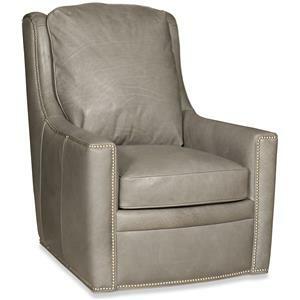 The Swivel Tub Chairs Marietta Traditional Swivel Tub Chair with Nail Head Trim by Bradington Young at Belfort Furniture in the Washington DC, Northern Virginia, Maryland and Fairfax VA area. Product availability may vary. Contact us for the most current availability on this product. Wood & Finish Multiple wood finish options. Seat Support All sofas, loveseats and chairs feature genuine eight-way hand tied custom coil construction that is unsurpassed in comfort and lasting quality. The "seat pleaser" coil spring seat foundation is the most even and comfortable seating in motion furniture. This collection of Swivel Tub Chairs will complete your living room no matter what your style. 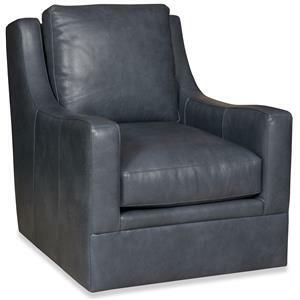 These glider chairs have stylish details, including attractive split back cushions, welts, and nail head trim. These chairs are ultra comfortable, with plush cushions and deep seats that will keep you cozy. These gilder chairs are available in over 300 fabrics and 250 high quality leather by special order, with multiple nail head trim options. These chairs are also available with swivel motion. The Swivel Tub Chairs collection is a great option if you are looking for Traditional furniture in the Washington DC, Northern Virginia, Maryland and Fairfax VA area. Browse other items in the Swivel Tub Chairs collection from Belfort Furniture in the Washington DC, Northern Virginia, Maryland and Fairfax VA area.